It was freezing and snowing here last week. Summer in Kyoto is humid and sometimes hard to breathe even though winter is also very cold. It doesn't snow a lot but the air is dried so that you feel colder. 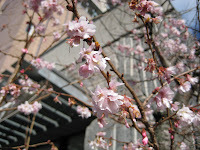 In such cold weather, the first cherry blossom blooms! Isn't it beautiful? 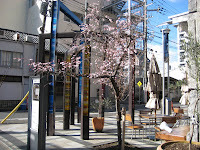 I don't know very well but there are several kinds of cherry trees. The tree stands Oike street, so it is watched by many people passing by. Cherry bloosoms usually start to bloom from end of March. I believe Kyoto is the most beautiful place for cherry bloosom in Japan or maybe in the world. Come to Kyoto in spring! 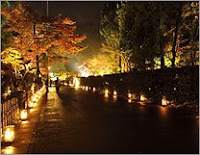 From March 13th to 22nd, Special Night-time illumination which is called Hanatouro is going to be held in Kyoto. Hana means flower and touro means lantern. Literally gion area are decorated with lanterns and flowers. Paths, temples and shrines change its atmosphere and look like an illusion. Illumination hours is 18:00 to 21:30. Check more details below. This event is held only every early spring, why don't you come to Kyoto during this time? IYEMON is a tea brand established in Kyoto. They opened the first tea salon last year here. It is still new, so the cafe is very clean and beautiful. There is a garden beyond the cafe seen from every seat. I sat beside the window, so I could see the garden and it was bright. I went there at luch time. 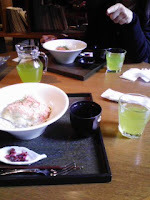 There are several choices for lunch and they serve free green tea instead of water. Actually they serve different tea every day. I find it is great, isn't it? The cafe open from morning untill night. Depending on when you go, menu is different. For example, in the morning, rice ball or sandwich things like that... are served. At dinner time, the cafe changes like a bar or restaurant. Why don't you go there if you stay at Kyoto? Japanese people visit a shrine at New Year which is called "Hatsumode". We pray happiness and peace for new year. Many shrines are set at shrines and it looks like a festival. Amazake which is sweet sake is sold at shrine as well. 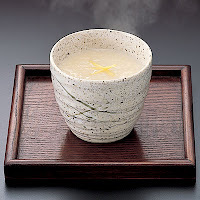 This very sweet, hot and little sake taste drink makes your body warmer! I went to Heian shrine this year. 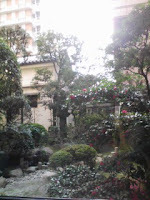 It takes about 30 minutes from NISHIYAMA RYOKAN. It was very crowded with visitors but it was fun! It made me feel new year has come. If you visit Kyoto, wouldn't you like to stay in Gion area and have Kyoto cuisine with maiko? You could spend a perfect night in Kyoto. Many tourists ask us where they can see Maiko. This is difficult to answer because Maiko doesn't always walk in Gion area. If you would like to see Maiko and have more experience with them, Gion Hatanak is a place for you. Gion Hatanaka is located in Gion area and close to Yasaka shrine. The location is convenient for sightseeing. They offer Maiko plan for tourists. You can enjoy beautiful Maiko show with having dinner. In addtion, you can take photos or even talk with them. If you are interested in it, please check out the Gion Hatanaka's website. Kakizome event was held on January 3rd. 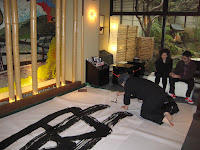 This big calligraphy is been hanging in the lobby. It is wonderful! We held it in the morning, so some people had to leave early and couldn't join us. We are afraid about that but still many people took part in this Japanese traditional event. Thank you for coming and we hope everyone enjoyed our first event this year. 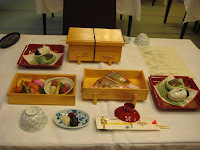 We are planning tea ceremony in February. 2009 has just started. We wish everyone has a happy new year! We serve a special breakfast at New Year. It is called osechi-ryori and this is a traditional to have the one on New Year. 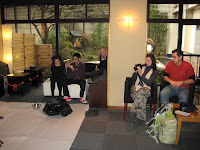 We hope our guests who had it enjoyed traditional New Year. 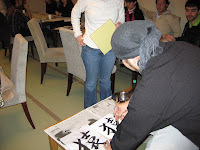 Tomorrow, we are going to have an event of calligraphy in the lobby. Anybody can come and join us!